You remember the Soul Reaver series right? With Raziel and Kain? Yeah, all that time travel stuff sure got weird, huh? 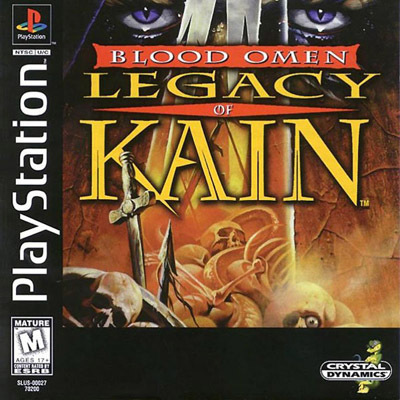 Ok, now do you remember Blood Omen: Legacy of Kain on the PS1? Chances are pretty slim on that one. Well, just in case you don't, that marked the beginning of the Soul Reaver series. While it had some interesting ideas, it might be better off being remembered instead of revisited. Blood Omen tells the tale of Kain, who is killed in the opening minutes of the game, only to take a deal with a sorceror to be resurrected and get revenge. Beyond that, the story just gets more confusing and convoluted. I wasn't entirely sure what I was doing, but I knew I had to kill whatever was in that glowing mark on the world map. The game takes itself a little to seriously, so if you're not into the dark and brooding thing, you may just want to skip the talking parts as often as possible. However, to it's credit, the world it creates is interesting and feels like a fully fleshed out universe. Part of that is in little markers throughout the world that give you a little background on each town or castle that you come across. It helps to give you an idea of what's happening here, even if none of the elements really seem to link together. The feeling of the world is also helped by the fantastic voice acting throughout. Even though what they're talking about makes little sense, it sure sounds nice. These markers help with pointing you in the right direction without explicitly doing so. It creates a really cool feeling of seeming to create your own path through the world even though the game is helping you along. Towards the end of the game though, I must confess that I resorted to cheat codes. It gets to a point where the controls fall well short of what the game is asking you to do. And rather than get frustrated constantly with annoying deaths, I decided to take the cowards route. I honestly don't know if I could have finished the game without them. But I did finish it, and overall, I enjoyed my time with the game. It's incredibly interesting to see the origins of what became a popular series and how that series strayed so far from it. weird. And that also explains why the cut the first game's plot down to about 5 minutes of story in Legacy of Kain: Soul Reaver. Trying to create their own fiction from basically the bad ending of Blood Omen. Blood Omen was a game full of interesting ideas, but was capped off by the limitations of the controls and hardware. While it's not a game I can recommend without reservation, if you're interested in the beginnings of the Soul Reaver series, it is available through PSN for $6.